It's never too soon to start thinking about your future. Below you can find information about all of the Westphal College's summer educational opportunities. Discover your major at Drexel University’s Westphal College of Media Arts & Design during one of our Fall Workshops. These free, full-day, hands-on workshops get you in our studios and classrooms. Spend a day experiencing college level instruction with awarding winning faculty. Our workshops are project driven, hands-on educational opportunities that connect you with creative industries. Experience what it’s like to be a Westphal student and discover how a Westphal education can help you reach your career goals. Our program is designed to explore cinematic storytelling through a one-week, intensive course. By working with Drexel faculty and professional equipment, you will not only learn how to make a film, but why particular choices are made. By focusing on shot composition, mise-en-scène, screen direction, and continuity, you will better understand visual storytelling in both the film and television industries. The course is design to both welcome novice filmmakers and grow experienced film students. This one-week non-residential program is designed to allow students the opportunity to explore the intersections of technique, choreographic process and dance as a healing art. Each day will consist of two technique classes, a seminar on careers in dance, choreographic process and choreographic work time. The week will end with a culminating performance. For two exciting weeks come explore the areas of Industrial Design and Making at Drexel University. This two-week commuter workshop will expose you to a range of possibilities within digital design including 3D printing, 3D modeling, laser cutting, and CNC routing. You'll attend classes taught by Drexel faculty members in our Hybrid Lab, and have visits to sites in Philadelphia to inspire you, and enhance your workshop experience. In addition, while working closely with an instructor, you'll try your hand at designing your own prototypes and models. If you are an innovator who has considered industrial design, product design, or product development ­ this program is for you! It will provide you with hands on experiences that allow you to bring your own ideas and designs to life. For two stimulating weeks, come live on our campus and explore the fields of Architecture, and Interior design. 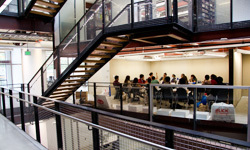 You will choose your area of study and collaborate in cross-disciplinary studios. Gain an understanding of each program and the ways they inform each other to further enhance your projects. Drexel’s professional full time faculty of architecture and interior design teach the summer programs in studios and labs used by our very own students with coursework drawn from our undergraduate curriculum. The program includes sketching, drawing, designing, and model making along with professional guest lectures to produce a project that can be added to your portfolio. Field trips provide an insider’s look at professional design firms to see firsthand the types of projects they work on and how they work in partnership with other disciplines to create built environments. You’ll visit significant buildings and cultural centers of Philadelphia. Best of all, you will get to know Drexel and the Westphal College experience. Eligibility: High school students at least 16 years of age who have completed their junior year by the start of the program are welcome to apply. For one week, come live on our campus and explore “hands-on” the field of Fashion Design. You will attend a carefully designed curriculum consisting of lectures, demonstrations, studio work, activities, and field trips. Faculty members all have extensive experience in various aspects of the fashion industry. You will research concepts, develop ideas through sketching, and use innovative technology to produce a variety of sample projects that can help you develop a fashion portfolio. This unique opportunity will immerse you in the world of fashion while offering you a true preview of the college experience. During your stay, visit local fashion studios and go on field trips to discover cultural attractions in the Philadelphia area. Best of all, you will get to know Drexel and the Westphal College experience. Eligibility: We welcome motivated high school students who are at least 16 years of age and who have completed their sophomore or junior years of high school by the start of the program. We encourage anyone who is excited about design to apply. The program is limited to 16 students in Fashion Design. For one week, come live on our campus and explore “hands-on” the fields of Fashion Merchandising. You will attend a carefully designed curriculum consisting of lessons, activities, and field trips. Faculty members all have extensive experience in various aspects of the fashion industry. You will work individually and in teams to complete a variety of projects. This unique opportunity will immerse you in the world of fashion while offering you a true preview of the college experience. During your stay, visit some of Philadelphia's top cultural attractions. Best of all, you will get to know Drexel and the Westphal College experience. Eligibility: We welcome motivated high school students who are at least 16 years of age and who have completed their sophomore or junior years of high school by the start of the program. The Graphic Design program at Westphal College of Media Arts & Design offers an exceptional one-week intensive residential program in graphic design taught by award-winning faculty, and open to high school students interested in learning about the vast creative world of visual communication. Hands on studio classes include projects and critique leading to portfolio-ready work. Studio classes are supplemented by cultural field trips, guest presentations by faculty, industry professionals and alumni, special events, and more. All designed to give students a chance to help build their portfolios and to get a sense of career opportunities in graphic design. Our summer program for is designed to introduce you to the music industry as a whole—through a one week intensive workshop of audio technology and business. The courses offered are based upon the degree curriculum and are taught by our faculty of industry professionals. Through the classroom, hands-on studio experience in our recording lab facilities, performance opportunities, lectures, and guest speakers, you will gain valuable insight into, and practical knowledge of, this dynamic field. You’ll get an insider’s view into the most current issues in the music industry. The one week residency Photography Workshop will be an intensive exploration of the many facets that make up photography in the 21st century. We will cover all main areas of the medium with one-two day intensive lessons. We will begin in the studio covering the workflow of lighting both still life and portraits. Then we will move into our state of the art digital labs where we will learn how to harness the full power of Photoshop and make large prints from the prior two days in the studio. Finally, we will spend two days in the darkroom exploring the alchemy that make traditional photography such a magical process. We will also be going on a field trip to the Philadelphia Museum of Art to visit their Prints and Photographs collections where you will see first-hand, prints made by the masters of the medium. Finally, the workshop will culminate with an exhibition of the work produced by the students that parents and the public will be invited to attend to view.